Thursday Boots. Have you heard of this company before? They have a serious online marketing campaign through Facebook sponsored posts, Youtubers and Instagram influencers. Most likely if you're following a style blogger you may have come across this brand. As the name suggests, they specialize in boots ranging from the workers boot to the chukka boot. Well a couple weeks ago, I was mindlessly scrolling through facebook and I saw a Thursday Boots ad for some shoes that weren't boots. On April 26th, they were going to hold a special 24 hour sale on their new line of dress shoes from wholecuts, derbies, oxfords and loafers. Makes sense for them to expand like this and the prices were attractive starting at $80 and going up to $120 and the cool part was you get to choose your price. Really wish alot of companies would use this concept. To promote their new shoe line Thursday Boots gave you the option to choose your price with a couple stipulations. Starting at the lowest of $80 to can get a pair. 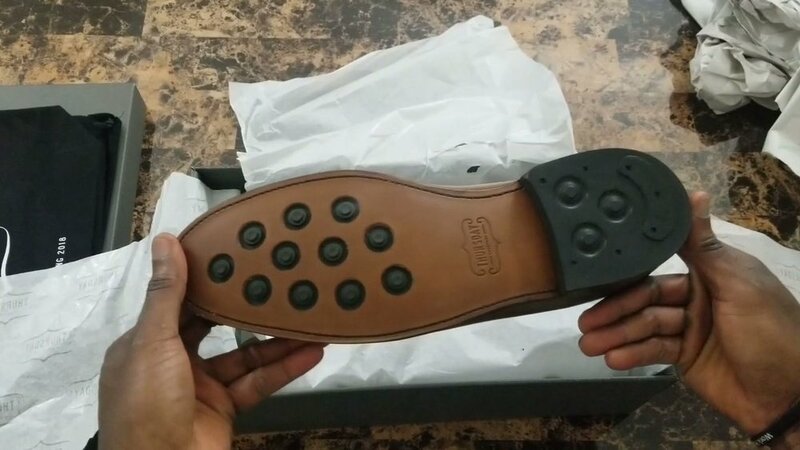 Why so low for a good quality leather shoe? Well Thursday takes pride in cutting out the middle man and ridiculous mark ups and bringing you quality shoes at an affordable price. The only catch at that price range is there were no returns or exchanges so if you chose this you better get your exact size. Prices $81-$119 would have a $30 charge for return or exchanges, not bad. Prices $120+ had free returns and exchanges. Their boots usually range at the $119 price point which is still not bad but if you can get your right size at $80, that's a steal!!! Thursday Boots really gave me a tough choice. Didn't care much for the Derbies, I have enough of those. Oxfords are cool but didn't catch my eye. So I oscillated between between the wholecuts and the loafers, both of which I don't have. One must prevail because by the time I got to the website half of the shoes were sold out and the two I wanted only had a limited number of sizes left. So I had to pull the trigger fast, the light brown Lincoln Loafer it is then. Versatile color and season appropriate for the spring and summer. Let's start with the obvious, the leather. This shoe is made from Horween Chromexecel Leather made out of the Horween Leather Factory out in Chicago. This is the same factory the produce sporting leather goods such as footballs, basketballs and baseball gloves so you know this type of leather can take a beating for long time and still hold up. I opted for the vegetable tanned Cordovan (vegetable tanned is the most traditional, time consuming and organic in the leather making process), I felt it was the most versatile of the three options they had. As with all their shoes, these came with goodyear welt which alot of style guys would say is better than the blake stitching as far as the longevity of the shoe. It has a rubber/leather hybrid outsole. Best to take to your nearest cobbler to see how it can be resoled when the time comes. It's genuine leather interior has little padding in it so if you plan on walk or standing in these for a long time, your feet will hurt. I'm glad Thursday Boots is expanding and introducing a new line of shoes into their collection. I think it's smart to start with the basics like oxfords, derbies and loafers but I'd hope they'll bring in more like the double or single monk straps or maybe bi/tri color leather shoes. I appreciate creases on my shoes however I'd like for it to appear over time, the creases on these loafer happened within minutes of wearing them. Not a deal breaker but still a little surprised to see them so early. I intend to get another Thursday Boots shoe, probably the wholecuts I had my eyes on and definitely an actual boot. Supplies will be restocked June 1st, stay on alert, they will most likely be sold out again. SUMMER, SUMMER SUMMERTIME! According to the calendar, we are officially in summer even though New England weather has a mind of it's own (as I write this it's 44 degrees outside). But summer time brings great events, concerts, bonfires, beach trips and one of my favorites: day parties. Business casual. I've seen various definitions of this and others have debated about it over the years. Here's my attempt to simplify it, let's break it down. What would be considered business attire? Three piece suit, two piece suit, braces underneath the suit, button down shirt, conservative tie…….. There is a running joke among my friends, that whoever I marry needs to understand and accept that I love shoes and probably have more than her. Snapple facts and I'm proud of it! Like most men in menswear, when I started getting my wardrobe right I let my wallet dictate my purchases. Understandable and fair, I could only ….